ST. MARYS — The librarians of the Pottawatomie Wabaunsee Regional Library here have their summer food program down to a science. “I know my people that want oranges,” said Colette Goldade, processing clerk of the St. Marys library branch. As if to demonstrate her point, a small girl in a blue dress walks up and quietly asks for an orange. Before she has finished speaking, Goldade’s plastic-gloved hands have deftly quartered the fruit and handed it to the child, who rejoins the 30 or so kids eating lunch in the next room. For the past three years, the staff and children at the St. Marys library have participated in the Summer Food Service Program (SFSP), which is funded by the U.S. Department of Agriculture and designed to give children access to free, nutritious meals when school is not in session. Sponsored by Catholic Charities of Northeast Kansas, St. Marys’ library serves lunch three days a week throughout June and July. Though the meal is geared toward low-income families, there are no income requirements to participate and all are welcome to attend. 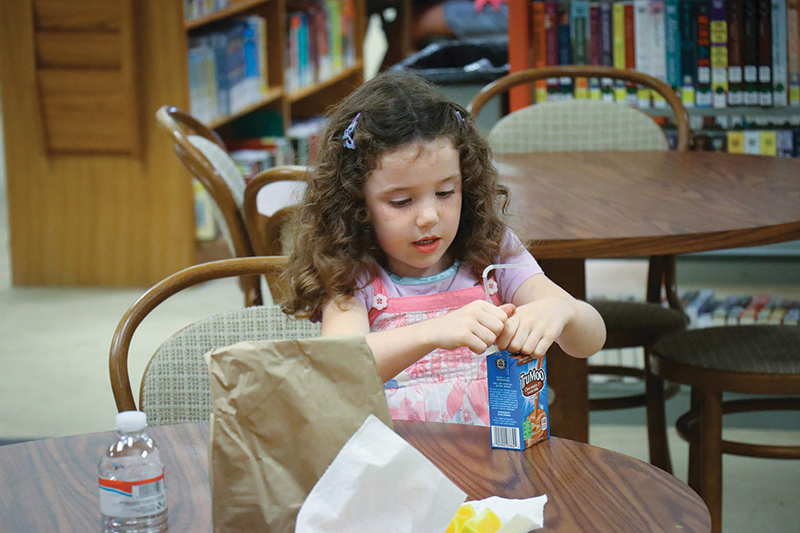 The summer food program is held in conjunction with the library’s Summer Reading Program. In addition to the daily meal, the librarians read to the children, lead crafts and bring in speakers. Melanie Smith, branch librarian, said the two programs complement each other. “We get new kids who are like, ‘Oh, you bring food here?’” she said. That’s because some kids that already come for the library’s programming are surprised to learn of the free lunches. Meanwhile, others who come originally for the lunches are then being turned onto the programming. The Pottawatomie Wabaunsee Regional Library partners with Catholic Charities of Northeast Kansas to provide meals at seven of its library locations. Catholic Charities furnishes the libraries with food and supplies necessary to run the site. The library staff, in turn, serves the meals in their respective communities with the help of local volunteers from Immaculate Conception Church, the St. Marys Knights of Columbus and others interested in lending a hand. It was the lack of resources in these small rural communities that first inspired the library system to participate in the program. “Originally, the other organizations [in the area] weren’t really doing summer food or any kind of food options really, and so there was kind of a gap,” explained Judith Cremer, library director. Kansas consistently ranks in the bottom five of states for children’s participation in SFSP, serving only eight summer lunches for every 100 free and reduced lunches served during the school year. This is due in part to Kansas’ large percentage of rural communities — the scattering of Kansas kids across farms and other remote areas makes it difficult to access large numbers of children at once. Catholic Charities of Northeast Kansas was well aware of these challenges when it first launched its summer food program four years ago. Camille Pickhinke, parish and community outreach coordinator for Catholic Charities, said that much of its 21-county service area is made up of rural communities that can be described as food and resource deserts — locations where there are no grocery stores, community resources or public transportation. “We felt we could be part of the solution,” Pickhinke explained. What began modestly in 2015 with just eight sites serving a total of 3,000 meals has since expanded to more than 30 sites, ranging from libraries, parks and swimming pools to community centers and schools. In 2017, Catholic Charities served more than 15,000 meals to adults and children, a number the agency expects to match this year. In addition to the increase in children served, Pickhinke notes that Catholic Charities has also been able to expand the services offered at each site: providing fresh produce as well as adult meals. “After noticing that adult caregivers who were bringing their children to the sites were also in need, we partnered with several of our parishes who generously provided well-balanced sack lunches for adults,” says Pickhinke, who first joined the program in 2016. Catholic Charities has also rolled out a limited “weekend bag” component at select sites: While SFSP requires that meals served must be eaten on-site, weekend bags can be taken home to help tide a child over until the next meal service. These bags are also thanks to donations from parishes. Despite the program’s growth, the challenges of operating a large number of rural sites persist. With sites as much as three hours from Catholic Charities’ warehouse and main office, it can be difficult to support a site when problems arise. Transportation of food and supplies to these communities is costly, and sites generally serve far fewer kids than their urban counterparts. Still, Pickhinke said, the effort involved is well worth it if it means reaching families in areas not typically supported by social service programs. Denise Rainey, who has been bringing her three children to the St. Marys summer food program for the last three years, said the program is an enjoyable experience for them all. “It’s a good way to meet new people, for the children to meet their friends,” she said. And she really appreciates that Catholic Charities has continued to operate the program. “I think it’s an asset to the community,” she added. Wildhaber is an AmeriCorps VISTA member working at Catholic Charities of Northeast Kansas, assisting with the Summer Food Service Program.